XLRI : News - From Campus & Alumni: XLRI Inaugurates Interdisciplinary "Behavioural Lab"
XLRI Inaugurates Interdisciplinary "Behavioural Lab"
Sept 17th, 2011: XLRI inaugurated the "Behavioural Lab" to become India's 1st management school to have an interdisciplinary lab to study human behaviour. 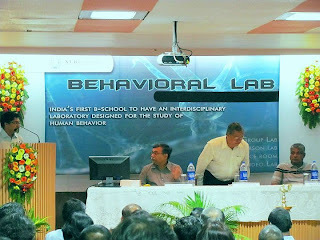 A brain child of Dr Sanjeev Varshney, Chief Coordinator and Area Chairperson (Marketing) and MAXI (Marketing Association of XLRI), "the Lab is equipped with software and equipments to run experiments based on the principles of cognitive psychology, like direct response time machine, and will help in understanding whether the stimulus shown to people is having emotional or cognitive impact. The Lab also has got facilities like one-way mirror observation rooms for group experiments etc. It has subscribed to other software to enable students and researchers in testing image-based stimulus rather than textual stimulus and thereby facilitate product and campaign effectiveness testing," informed Prof Varshney. The Lab will be available for use across all functional disciplines of XLRI comprising XLRI faculty, Fellow researchers, and postgraduate students. The Lab will also collaborate with researchers and institutes of repute in the field and looks forward to establishing itself as a one-stop solution for all behavioural and neurological research in management sciences. It aims to bring in new and innovative insights in the field of management. As the first project of the “Behavioural Lab”, the city-based XLRI School of Business has started conducting research to study the behaviour of youth that leads to road accidents. Prof Sanjeev Varshney said that rash driving is matter of great concern for the city. They have started the research considering the rising number of deaths among young motorcyclists. Prof Pranabesh Ray (Dean - Academics) said that the Lab’s future plans include acquiring more equipment and software for carrying out neurological research by collaborating with local and national level neuro-research centres and leading hospital chains in India. The collaboration process has already been initiated. “We have plans to study and conduct research on Consumer Behaviour Studies, Organisational Behaviour Studies, Behavioural Economics and Behavioural Finance, to name a few of its primary areas of interest,” said Prof. Ray.